After regularly donating blood for several years, the Red Cross contacted me regarding my high platelet count. 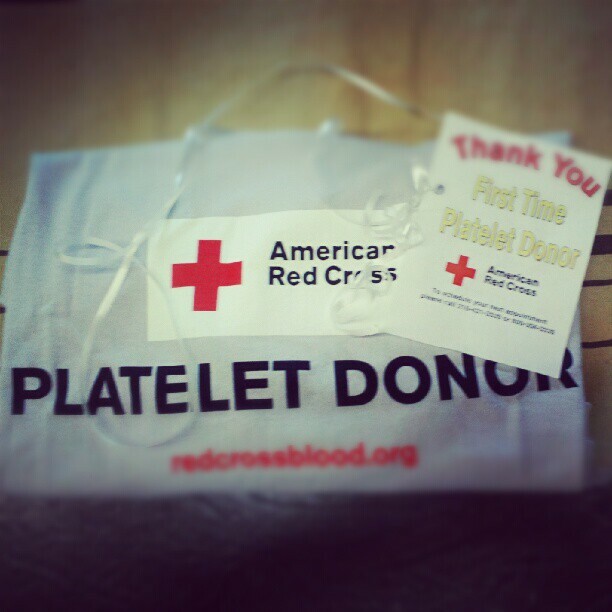 They asked me if I would consider donating platelets, so I said sure. I knew that whole blood and platelets were always in high demand. They assured me that it was very similar to donating whole blood with a few differences. Well, it was and it wasn’t. Platelet donation involves a bigger time commitment (typically 2 hours) and involves a little more machinery. However, it does still use a single needle in your arm. (Update: The Red Cross has gone back to a two-needle donation process.) It wasn’t painful although I did feel a little weird during the process. Maybe that was just me though! My biggest problem was my body temperature. It kept falling below where it should have been, which alerted the machines. It seemed like a Red Cross technician was constantly coming over to make it stop beeping. (I almost felt like I was hoarding their time although they were really nice about it.) When the machine beeped, the needle would actually vibrate in my arm because my vein was hardening. It was a strange sensation, although not painful. It was more of a discomfort, because it made the needle entry into my arm feel tight. Donate blood or platelets today! I was wrapped in blankets (including one around my arm) with a heating pad on medium heat on top of me. I was even given a heat pack to squeeze instead of a stress ball in order to warm up my arm. I did make it through the experience, and I’m glad I did it. Despite the body temperature issues, I’ll probably donate platelets again, because they’re always in such high demand. Your platelet donation has the power to enhance the lives of up to 3 patients in your area. With a shelf life of only 5 days, platelets are in constant demand. In order to meet the patient needs in Northern Ohio, the Red Cross must collect over 300 platelet products each week. You can donate platelets up to 24 times in a year and still continue to donate whole blood. Have any other platelet donors experienced internal body temperature issues while donating? If so, do you have any suggestions on how to better regulate for next time (besides wearing a parka)? Ha! I would love to hear of your experience and any suggestions. For additional information on donating platelets, visit http://www.redcrossblood.org/donating-blood/types-donations/platelet-donation. Save a life… donate blood or platelets if you can! As noted in my previous post, I love watching the Olympics. It’s amazing to see so many amazing athletes from around the world gather in one place to compete. I was invited to participate in NBC’s 2012 Olympics Diary, which helps the network gauge the effectiveness of its coverage via all platforms. As a participant in this study, I’ve tried to sample the various coverage options available — NBC, NBC Sports & partner channels, nbcolympics.com, the NBC Olympics app, the Live Extra App and, of course, social media. Being billed as the first “social media Olympic Games,” the coverage — especially from athletes themselves — have opened access to fans beyond what was previously possible. I’ve enjoyed some of the non-traditional platforms, such as the Live Extra app (available for iPhone and Android), which allows you to watch live streaming action of your favorite sports and athletes, as well as view recorded action. Select your favorites, so you can easily locate the game or match you’re looking for later. Also, it’s been interesting hearing so much directly from the athletes themselves and from fellow fans discussing the festivities. During the course of the Games, Michael Phelps gained his one millionth Twitter follower, an incredible feat for a swimmer. Of course, he’s also the most decorated Olympian of all time. But I think it speaks to how social media can be an avenue for athletes of all types to bypass traditional media coverage and develop a rapport with fans. 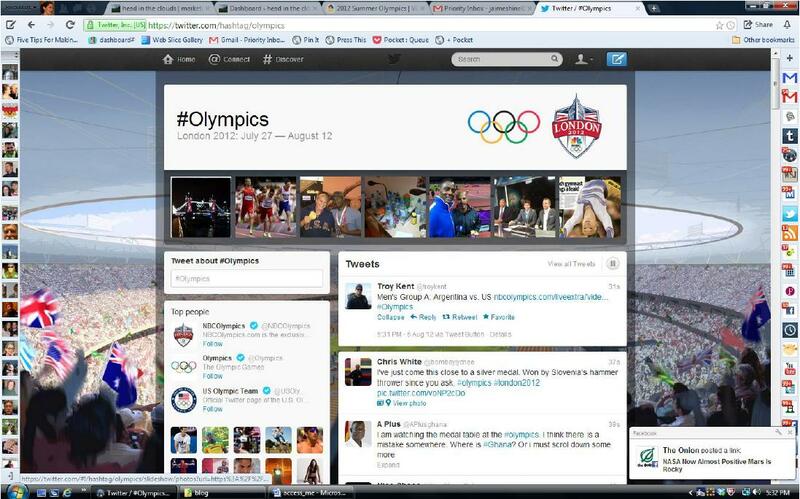 How have you watched the Olympics? Do you prefer to wait until prime time on TV or have you been following via live streaming online or social media? Maybe a combination of multiple platforms like I have? I’m happy to be participating in NBC’s Olympic Diary, and I hope our feedback will continue to help improve coverage for future Olympics. Are you participating in this study? If so, what are your thoughts? If not, what constructive feedback would you have for NBC? I’d love to hear your thoughts! In the meantime, I’ll continue to enjoy competition between the greatest athletes in the world.